The tops conjure up emmories of great games, championships and memorable hockey nnights at Fife Ice Arena. And on Saturday, the rink will be filled with many more as Fife Flyers turn back the clock for a special retro night as part of their annual CHAS fundraiser this weekend. 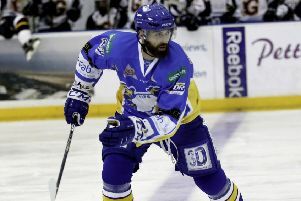 The ice hockey team is appealing for fans to turn up wearing the OLDEST team tops they can find! The annual event also aims to raise more money for CHAS to top up the £50,000 netted so far through the partnership first launched by former player-coach, Mark Morrison, in the 1990s. Flyers were the first pro sports team in the UK to add a charity badge to their official strips, and it has forged close ties with the families and staff at the Kinross hospice. To help promote the annual fundraiser, the Fife Free Press appealed for fans to dig out some old tops for a special photo-shoot, and our thanks to the Watterson family fromn Glenrothes, long standing fans who have amassed a huge number of sponsored strips over the years. The tops also gave today’s team a chance to see how they kit looked in the 1990s and even the late 1980s. The oldest top, from around 1990, was once worn by netminder Colin Downie and bore the famous ‘Avco’ name on the front – the financial companuy had a High Street base and were big sponsors back in the Heinekener era. From the 1990s there were strips worn by two legends – Doug Smail, the first man ever to sign for a UK club direct from the NHL, who iced in 1993-94, and record-breaking powerplay goalscorer Russell Monteith, part of the legendary Grand Slam team of 2000. And finally, a top from the early noughties, formerly worn by Ian Fletcher in 2003-04, who hailed from Edmonton and joined the team for one season from the University of Alabama-Hunstville. The club hopes fans will come to Saturday’s huie game against Glasgow Clkan wearimng their own favourite tops from ascross the decades. It plans to turn the strip show into a competition with the winner scooping a replica of the current 80th anniversary top. The night will also include a photo opportunity with the Gardiner Conference trophy, plus a bucket collection and raffle for CHAS, and an on-ice auction of the club’s white pre-season tops. Bids start at £70.